The VLSI Computation Laboratory (VCL) is part of the ECE Department at the University of California at Davis. Our goal is to discover and develop novel contributions in high-performance, energy-efficient, and area-efficient VLSI computation with an emphasis on digital signal processing (DSP), multimedia, and embedded workloads, and new projects in datacenter and scientific (supercomputing) kernels. 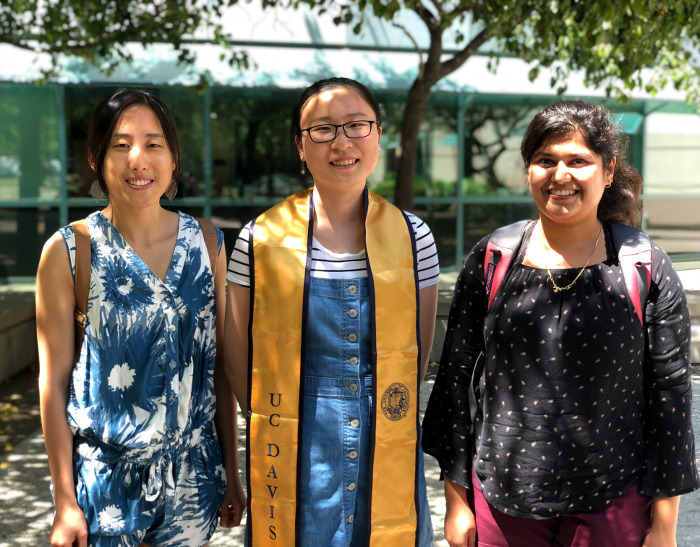 Research is accomplished with a multi-disciplinary view of algorithms, architectures, arithmetic, functional units, circuits, VLSI design, applications, and software tools of both programmable and special-purpose processors. We are one of very few university groups in the world that design and fabricate programmable (and configurable special-purpose) processor chips. Our research is grounded in achieving the aforementioned goals on widely-used applications measured in our laboratory on advanced deep-submicron CMOS fabricated chips which we have designed. We believe we have designed the #1 and #2 highest clock rate fabricated processors and among the largest deep-submicron CMOS chips ever designed in a university. Media encoder design, Component Design Engineer. Programmable fine-grain many-core architectures and circuits. Programming tool development such as compilers, optimization, and mapping tools. Complete deep-submicron CMOS chip designs. Many members of the VCL are participating in work on the circuits, functional units, architecture, interconnection network, algorithms, applications, and tools for a high-performance and energy-efficient processing system targeting computationally-demanding multi-algorithm DSP system applications. The single-chip processing system is comprised of a large number of fine-grain asynchronously-operating programmable processors connected by a reconfigurable 2-dimensional mesh network. AsAP 1. The 0.18 μm AsAP 1 chip contains 36 programmable processors, operates at over 610 MHz at 2.0 V, and is believed to be the second highest clock rate processor designed in any university. Details of the chip were presented in the Technology and Architecture Directions session at ISSCC in Feb. 2006. See the paper below. Also see the EE Times article "Asynchronous array of processors chip presented at ISSCC 2006," February 9, 2006. AsAP 2. A second generation 65 nm CMOS design contains 167 processors with dedicated FFT, Viterbi, and video motion estimation processors; 16 KB shared memories; and long-distance inter-processor interconnect. The programmable processors can individually and dynamically change their supply voltage and clock frequency. The chip is fully-functional. Processors operate up to 1.2 GHz at 1.3 V which is believed to be the highest clock rate fabricated processor designed in any university. At 1.2 V, they operate at 1.07 GHz and 47 mW when 100% active. At 0.675 V, they operate at 66 MHz and 608 μW when 100% active. This operating point enables 1 trillion MAC or ALU ops/sec with a power dissipation of only 9.2 Watts. Due to its MIMD architecture and fine-grain clock oscillator stalling, this energy efficiency per operation is almost perfectly constant across widely varying workloads--which is not the case for many architectures. A third generation design was presented at the Symposium on VLSI Circuits, June 2016. 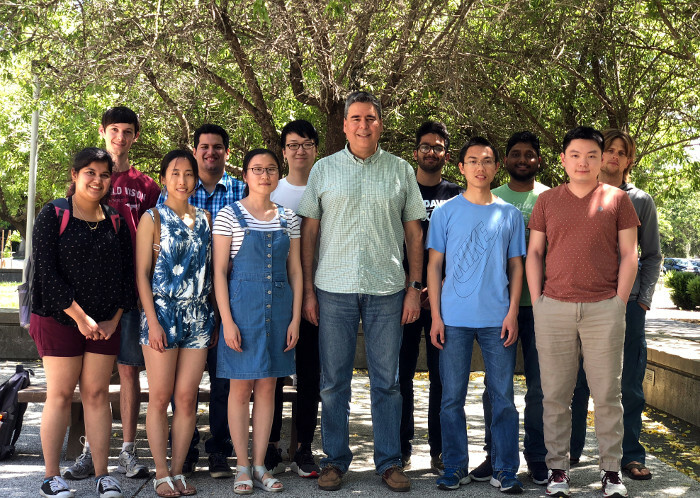 The authors acknowledge the support of the C2S2 Focus Center, one of six research centers funded under the Focus Center Research Program (FCRP), a Semiconductor Research Corporation entity. Publications in review are provided to sponsors but not yet listed here. "Sparse Matrix Multiplication on a Many-Core Platform,"
Masters Thesis, Technical Report ECE-VCL-2018-1, VLSI Computation Laboratory, ECE Department, University of California, Davis, December 2018. IEEE Asilomar Conference on Signals, Systems and Computers (ACSSC), Pacific Grove, CA, October 2018. IEEE SOI-3D-Subthreshold Microelectronics Technology Unified Conference (S3S), Burlingame, CA, October 2018. IEEE International Midwest Symposium on Circuits and Systems (MWSCAS), Windsor, ON, Canada, August 2018. "Methods for Reducing Floating-Point Computation Overhead,"
Ph.D. Dissertation, Technical Report ECE-VCL-2017-2, VLSI Computation Laboratory, ECE Department, University of California, Davis, August 2017. "A Configurable H.265-Compatible Motion Estimation Accelerator Architecture for Realtime 4K Video Encoding in 65nm CMOS,"
In Proceedings of the IEEE Conference on Dependable and Secure Computing, Taipei, Taiwan, August 2017. "The Design of the KiloCore Chip,"
ACM/IEEE Design Automation Conference, (DAC), Austin, TX, June 2017. "Scaling Equations for the Accurate Prediction of CMOS Device Performance from 180 nm to 7 nm,"
Integration, the VLSI Journal, vol. 58, pp. 74–81, June 2017. "KiloCore: A 32 nm 1000-Processor Computational Array,"
IEEE Journal of Solid-State Circuits (JSSC), vol. 52, no. 4, pp. 891–902, April 2017. IEEE Micro, vol.37, no.2, pp. 63-69, March-April 2017. "Energy-Efficient Pattern Matching Methods on a Fine-Grained Many-Core Platform,"
Masters Thesis, Technical Report ECE-VCL-2017-1, VLSI Computation Laboratory, ECE Department, University of California, Davis, March 2017. In Proceedings of the IEEE HotChips Symposium on High-Performance Chips (HotChips 2016), Cupertino, CA, August 2016. "Hybrid Hardware/Software Floating-Point Implementations for Optimized Area and Throughput Tradeoffs,"
IEEE Transactions on Very Large Scale Integration Systems (TVLSI), vol. 25, no. 1, pp. 100-113, January 2017. (Official date of publication July 12, 2016). "A 5.8 pJ/Op 115 Billion Ops/sec, to 1.78 Trillion Ops/sec 32 nm 1000-Processor Array,"
Symposium on VLSI Circuits, Honolulu, HI, June 2016. "Design of Energy-Efficient Many-Core MIMD GALS Processor Arrays in the 1000-Processor Era,"
Ph.D. Dissertation, Technical Report ECE-VCL-2015-1, VLSI Computation Laboratory, ECE Department, University of California, Davis, December 2015. "A Configurable H.265-Compatible Motion Estimation Accelerator Architecture Suitable for Realtime 4K Video Encoding,"
Masters Thesis, Technical Report ECE-VCL-2015-2, VLSI Computation Laboratory, ECE Department, University of California, Davis, December 2015. "Area Efficient Backprojection Computation with Reduced Floating-Point Word Width for SAR Image Formation,"
IEEE Asilomar Conference on Signals, Systems and Computers (ACSSC), Pacific Grove, CA, November 2015. "A Software LDPC Decoder Implemented on a Many-Core Array of Programmable Processors,"
"Energy-Efficient String Search Architectures on a Fine-Grained Many-Core Platform,"
Technology and Talent for the 21st Century (TECHCON 2015), Austin, TX, September 2015. "Hybrid Floating-Point Modules with Low Area Overhead on a Fine-Grained Processing Core,"
"Software/Hardware Hybrid Floating-Point Units with Low Area Overhead on a Fine-Grained Processing Core,"
Technology and Talent for the 21st Century (TECHCON 2014), Austin, TX, September 2014. "Hardware, Software, and Tools for an AsAP2 Many-Core System,"
Masters Thesis, Technical Report ECE-VCL-2014-1, VLSI Computation Laboratory, ECE Department, University of California, Davis, June 2014. "Time-Scalable Mapping for Circuit-Switched GALS Chip Multiprocessor Platforms,"
IEEE Transactions on Computer-Aided Design of Integrated Circuits and Systems (TCAD), vol. 33, no. 5, pp. 752-762, May 2014. "A Hexagonal Processor and Interconnect Topology for Many-core Architecture with Dense On-Chip Networks,"
Book Chapter in IFIP Advances in Information and Communication Technology, Springer, 2013. "Energy-Efficient Sorting on a Many-Core Platform,"
Technology and Talent for the 21st Century (TECHCON 2013), Austin, TX, September 2013. "Achieving High-Performance On-Chip Networks with Shared-Buffer Routers,"
"Processor Tile Shapes and Interconnect Topology for Dense On-Chip Networks,"
"Parallel AES Encryption Engines for Many-Core Processor Arrays,"
"Guest Editors' Introduction to Practical Parallel EDA,"
IEEE Design & Test, vol. 30, Issue 1, February 2013. "LDPC Decoder with an Adaptive Wordwidth Datapath for Energy and BER Co-Optimization,"
VLSI Design, vol. 2013, 14 pages, February 2013. "Energy-efficient Fine-grained Many-core Architecture for Video and DSP Applications,"
Ph.D. Dissertation, Technical Report ECE-VCL-2012-4, VLSI Computation Laboratory, ECE Department, University of California, Davis, December 2012. "Fine-Grained Energy-Efficient Sorting on a Many-Core Processor Array." "A Hexagonal Shaped Processor and Interconnect Topology for Tightly-tiled Many-core Architecture,"
IFIP/IEEE International Conference on Very Large Scale Integration (VLSI-SoC) , Santa Cruz, CA, Oct. 2012. Received an invitation to a Book Chapter. "On-Chip Network Designs for Many-Core Computational Platforms,"
Ph.D. Dissertation, Technical Report ECE-VCL-2012-3, VLSI Computation Laboratory, ECE Department, University of California, Davis, August 2012. Technical Report ECE-VCL-2012-2, VLSI Computation Laboratory, ECE Department, University of California, Davis, July 2012. Masters Thesis, Technical Report ECE-VCL-2012-1, VLSI Computation Laboratory, ECE Department, University of California, Davis, June 2012. "Energy-Efficient AES Ciphers on a Fine-Grained Many-Core System ,"
"Introduction to the Special Issue: Hot Chips 23,"
IEEE Micro, Volume 32, Number 2, March/April 2012. "Processor Shapes and Topologies for Dense On-chip Networks,"
presented in the IEEE International Solid-Sate Circuit Conference (ISSCC 2012) student forum, San Francisco, CA, Feb. 2012. "Toward More Accurate Scaling Estimates of CMOS Circuits from 180 nm to 22 nm,"
Technical Report ECE-VCL-2011-4, VLSI Computation Laboratory, ECE Department, University of California, Davis, December 2011. Masters Thesis, Technical Report ECE-VCL-2011-3, VLSI Computation Laboratory, ECE Department, University of California, Davis, December 2011. "A Fine-Grained Parallel Implementation of a H.264/AVC Encoder on a 167-processor Computational Platform,"
"RoShaQ: High-Performance On-Chip Router with Shared Queues,"
IEEE International Conference on Computer Design (ICCD), Amherst, MA, October 2011, pp. 232-238. "SAISort: An Energy Efficient Sorting Algorithm for Many-Core Systems,"
Masters Thesis, Technical Report ECE-VCL-2011-2, VLSI Computation Laboratory, ECE Department, University of California, Davis, September 2011. "Design of Bufferless On-Chip Routers Providing In-Order Packet Delivery,"
SRC Technology and Talent for the 21st Century (TECHCON), Austin, TX, USA, Sep. 2011, S14.3. "A Band-Gap Reference with Internal Digital Signal Processing,"
Technical Report ECE-2011, VLSI Computation Laboratory, Solid State Circuits Research Laboratory, ECE Department, University of California, Davis, July 2011. "A 1080p H.264/AVC Baseline Residual Encoder for a Fine-grained Many-core System,"
IEEE Transactions on Circuits and Systems for Video Technology, vol. 21, no. 7, pp. 890-902, July 2011. "A case for fine-grained many-core processor arrays,"
Parallel Algorithms, Programming, Architectures Workshop at the 48th ACM/IEEE Design Automation Conference (DAC), San Diego, CA, June 5, 2011. "Low Power LDPC Decoder with Efficient Stopping Scheme for Undecodable Blocks,"
In Proceedings of the IEEE International Symposium on Circuits and Systems (ISCAS), Rio de Janeiro, Brazil, May 2011. "A High Performance Baseband Instrument,"
Masters Thesis, Technical Report ECE-VCL-2011-1, VLSI Computation Laboratory, ECE Department, University of California, Davis, March 2011. Ph.D. Dissertation, Technical Report ECE-VCL-2010-4, VLSI Computation Laboratory, ECE Department, University of California, Davis, November 2010. "Implantable Radio Transmitters for Long Range Health Monitoring,"
Technical Report ECE-2011, VLSI Computation Laboratory, Solid State Circuits Research Laboratory, ECE Department, University of California, Davis, December 2010. "Massively Parallel Processor Array for Mid-/Back-end Ultrasound Signal Processing,"
In Proceedings of the IEEE Biomedical Circuits and Systems Conference (BioCAS), Paphos, Cyprus, Nov. 2010, pp. 274-277. "DLABS: a Dual-Lane Buffer-Sharing Router Architecture for Networks on Chip,"
In Proceedings of the IEEE Workshop on Signal Processing Systems (SiPS), Cupertino, CA, Oct. 2010, pp. 331-336. "An Energy-Efficient Parallel H.264/AVC Baseline Encoder on a Fine-grained Many-core System,"
Technology and Talent for the 21st Century (TECHCON 2010), Austin, TX, Sep. 2010.
International Conference on Communications and Electronics (ICCE), Aug. 2010, pp. 87-91. "A Reconfigurable Source-Synchronous On-Chip Network for GALS Many-Core Platforms,"
IEEE Transactions on Computer-Aided Design of Integrated Circuits and Systems (TCAD), vol. 29, no. 6, pp. 897-910, June 2010. "Circuit Modeling for Practical Many-core Architecture Design Exploration,"
In Proceedings of the 47th ACM/IEEE Design Automation Conference (DAC), Anaheim, CA, June 13-18, 2010, pp. 627-628. Wild And Crazy Ideas (WACI) Session. "A Low-Area Multi-Link Interconnect Architecture for GALS Chip Multiprocessors,"
IEEE Transactions on Very Large Scale Integration Systems (TVLSI), vol. 18, no. 5, pp. 750-762, May 2010. "A Fine Grained Many-Core H.264 Video Encoder,"
Masters Thesis, Technical Report ECE-VCL-2010-3, VLSI Computation Laboratory, ECE Department, University of California, Davis, March, 2010. "A Configurable Motion Estimation Accelerator For Video Compression,"
Masters Thesis, Technical Report ECE-VCL-2009-4, VLSI Computation Laboratory, ECE Department, University of California, Davis, December, 2009. "Trends and Challenges in LDPC Hardware Decoders,"
In Proceedings of the IEEE Asilomar Conference on Signals, Systems and Computers (ACSSC), November 2009, pp. 1273-1277. "High Throughput and Energy Efficient LDPC Decoders using Multi-Split-Row Threshold Method,"
In Proceedings of the IEEE International Conference on Communications (ICC'09), June 2009. In Proceedings of the IEEE International Symposium on Circuits and Systems (ISCAS), Taipei, Taiwan, May 2009, pp. 2449-2452. "A Low Cost High-Speed Source-Synchronous Interconnection Technique for GALS Chip Multiprocessors,"
In Proceedings of the IEEE International Symposium on Circuits and Systems (ISCAS), Taipei, Taiwan, May 2009, pp. 996-999. "The Design of a Reconfigurable Continuous-Flow Mixed-Radix FFT Processor,"
In Proceedings of the IEEE International Symposium on Circuits and Systems (ISCAS), Taipei, Taiwan, May 2009, pp. 1133-1136. "A GALS Many-Core Heterogeneous DSP Platform with Source-Synchronous On-Chip Interconnection Network,"
In Proceedings of the ACM/IEEE International Symposium on Networks on Chip (NOCS) , May 2009, pp. 214-223. Received an invitation to an IEEE Transactions on Computer-Aided Design of Integrated Circuits and Systems (TCAD) Special Issue. "High Performance, Energy Efficiency, and Scalability with GALS Chip Multiprocessors,"
IEEE Transactions on Very Large Scale Integration Systems (TVLSI), vol. 17, no. 1, pp. 66-79, Jan. 2009. VDM Publishing House Ltd., December 2008. Available at amazon.com. S. J. Yoo, V. Akella, R. Amirtharajah, B. Baas, K. Bergman, S. Fan, J. Harris, D. Miller, M. Lipson, J. Shalf. "Balanced Computing with Nanophotonic Interconnects." The 21st Annual Meeting of the IEEE Lasers & Electro-Optics Society, November 2008, pp. 368-369. In Proceedings of the IEEE Asilomar Conference on Signals, Systems and Computers (ACSSC), October 2008, MA8b1-8. "A Complete Real-Time 802.11a Baseband Receiver Implemented on an Array of Programmable Processors,"
In Proceedings of the IEEE Asilomar Conference on Signals, Systems and Computers (ACSSC), October 2008, pp. 165-170. "A High-Performance Parallel CAVLC Encoder on a Fine-Grained Many-core System,"
In Proceedings of the IEEE International Conference on Computer Design (ICCD), October 2008, pp. 248-254. In Proceedings of the Symposium on VLSI Circuits, June 2008, C3.1., pp. 22-23. "A Low-Area Interconnect Architecture for Chip Multiprocessors,"
In Proceedings of the IEEE International Symposium on Circuits and Systems (ISCAS), Seattle, WA, USA, May 2008, pp. 2857-2860. "Dynamic Voltage and Frequency Scaling Circuits with Two Supply Voltages,"
In Proceedings of the IEEE International Symposium on Circuits and Systems (ISCAS), Seattle, WA, USA, May 2008, pp. 1236-1239. V. Akella, R. Amirtharajah, B. Baas, K. Bergman, V. Carey, S. Fan, J. Harris, S. Islam, M. Lipson, K. Liu, D. Miller, J. Shalf, S. J. Yoo. "Energy-Efficient and Balanced Computing with Nanophotonic Interconnects and their Temperature-Insensitive Operation,"
HP Labs Photonic Interconnect Forum, 2008. Journal of Signal Processing Systems, March 2008. "Approaches and Designs of Dynamic Voltage and Frequency Scaling,"
Masters Thesis, Technical Report ECE-CE-2008-1, Computer Engineering Research Laboratory, ECE Department, University of California, Davis, 2008. "High Performance and Energy Efficient Multi-core Systems for DSP Applications,"
Ph.D. Dissertation, Technical Report ECE-CE-2007-5, Computer Engineering Research Laboratory, ECE Department, University of California, Davis, 2007. Received an invitation to publish the dissertation as a book. IEEE Transactions on Very Large Scale Integration Systems (TVLSI), vol. 15, no. 10, pp. 1125-1134, October 2007. "Algorithms and Software Tools for Mapping Arbitrarily Connected Tasks onto an Asynchronous Array of Simple Processors,"
Masters Thesis, Technical Report ECE-CE-2007-4, Computer Engineering Research Laboratory, ECE Department, University of California, Davis, 2007. "A Continuous-Flow Mixed-Radix Dynamically-Configurable FFT Processor,"
Masters Thesis, Technical Report ECE-CE-2007-3, Computer Engineering Research Laboratory, ECE Department, University of California, Davis, 2007. "AsAP: A Fine-Grained Many-Core Platform for DSP Applications,"
"A Shared Memory Module for Asynchronous Arrays of Processors,"
EURASIP Journal on Embedded Systems, vol. 2007, Article ID 86273, 13 pages, 2007. "High-Throughput LDPC Decoders Using A Multiple Split-Row Method,"
In Proceedings of the IEEE International Conference on Acoustics, Speech, and Signal Processing (ICASSP '07), April 2007. "Implementing Tile-based Chip Multiprocessors with GALS Clocking Styles ,"
In Proceedings of the IEEE International Conference on Computer Design (ICCD '06), October 2006, pp. 174-179. "Split-row: A reduced complexity, high throughput LDPC decoder architecture ,"
In Proceedings of the IEEE International Conference on Computer Design (ICCD '06), October 2006, pp. 320-325. "Performance and Power Analysis of Globally Asynchronous Locally Synchronous Multi-Processor Systems,"
In Proceedings of the IEEE Computer Society Annual Symposium on VLSI (ISVLSI '06), March 2006, pp. 378-384. In Proceedings of the IEEE International Solid-State Circuits Conference (ISSCC '06), February 2006, pp. 428-429, 663. "A Shared Memory Module for an Asynchronous Array of Simple Processors,"
Masters Thesis, Technical Report ECE-CE-2005-2, Computer Engineering Research Laboratory, ECE Department, University of California, Davis, 2005. In Proceedings of the IEEE International Conference on Acoustics, Speech, and Signal Processing (ICASSP) 2005, March 2005, pp. V-89-92. "A Full-Rate Software Implementation of an IEEE 802.11a Compliant Digital Baseband Transmitter,"
In Proceedings of the IEEE Workshop on Signal Processing Systems (SIPS '04), Oct. 2004. "A Dual-Clock FIFO for the Reliable Transfer of High-Throughput Data Between Unrelated Clock Domains,"
Masters Thesis, Technical Report ECE-CE-2004-5, Computer Engineering Research Laboratory, ECE Department, University of California, Davis, 2004. "Arithmetic Units for a High Performance Digital Signal Processor,"
Masters Thesis, Technical Report ECE-CE-2004-6, Computer Engineering Research Laboratory, ECE Department, University of California, Davis, 2004. "Fast Fourier Transforms on a Distributed Digital Signal Processor,"
Masters Thesis, Technical Report ECE-CE-2004-7, Computer Engineering Research Laboratory, ECE Department, University of California, Davis, 2004. "A Parallel Programmable Energy-Efficient Architecture For Computationally-Intensive DSP Systems,"
In Proceedings of the IEEE Asilomar Conference on Signals, Systems and Computers, 37th, November 2003. "Mapping an FIR Filter to a 2-Dimensional Mesh of Processors,"
Technical Report ECE-CE-2003-1, Computer Engineering Research Laboratory, ECE Department, University of California, Davis, 2003. "An Integrated 802.11a Baseband and MAC Processor,"
International Solid-State Circuits Conference (ISSCC), February 2002. "A Low-Power, High-Performance, 1024-point FFT Processor,"
IEEE Journal of Solid-State Circuits (JSSC), vol. 34, no. 3, pp. 380-387, March 1999. "An Approach to Low-Power, High-Performance, Fast Fourier Transform Processor Design,"
Ph.D. Dissertation, Department of Electrical Engineering, Stanford University, February 1999. "A 9.5 mW 330 μsec 1024-point FFT Processor,"
IEEE Custom Integrated Circuits Conference (CICC), May 1998. "Radioscience Receiver Development for Low Power, Low Mass Up-Link Missions,"
Planetary Instrumentation Definition and Development Program Workshop, Jet Propulsion Laboratory, June 1997. "Stanford Ultra-Low-Power CMOS Technology and Applications,"
In Low-Power HF Microelectronics, a Unified Approach, Chapter 3, pp. 85-138. The Institution of Electrical Engineers, London, UK, June 1996. "An Energy-Efficient Single-Chip FFT Processor,"
Symposium on VLSI Circuits, June 1996. "An Energy-Efficient FFT Processor Architecture,"
Technical Report NST-70340-1994-1, STARLab, EE Department, Stanford University, January 1994. "A Pipelined Memory System For an Interleaved Processor,"
Technical Report NSF-GF-1992-1, STARLab, EE Department, Stanford University, June 1992. EurekAlert news service operated by AAAS TechRadar, UC Davis News Service, and many others. a wide variety of multimeters, probes and other equipment and supplies. Virtually all instruments are GPIB (IEEE 488)-controllable and are connected to the laboratory's instrumentation control network. In addition to the group's instruments, through a sharing agreement with other groups in the Kemper 2201 laboratory, we have access to a vast array of other test and measurement equipment. 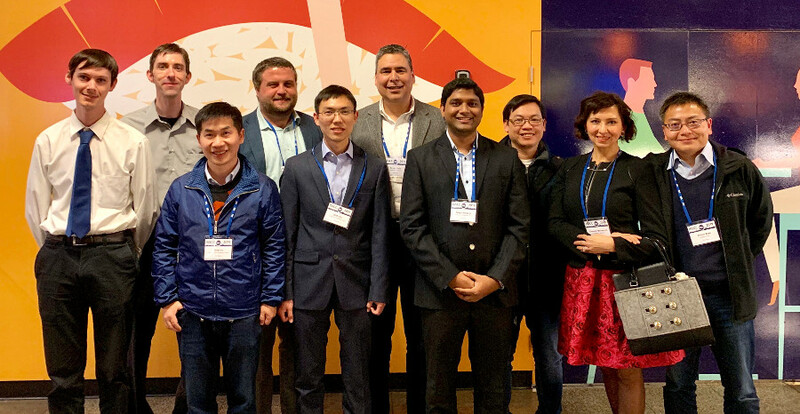 Tim, Brent, Prof. Zhiyi Yu, Prof. Aaron Stillmaker, Shifu, Bevan, Satyabrata, Dr. Anh Tran, Prof. Tinoosh Mohsenin, Dr. Zhibin Xiao at ISSCC, Feb 18, 2019. Sharmila, Tim, Yushan, Felipe, Yuanyuan, Renjie, Bevan, Sarvagya, Shifu, Satyabrata, Jin, Mark at graduation ice-cream celebration; June 14, 2018. Yushan, Yuanyuan, Sharmila; June 14, 2018. 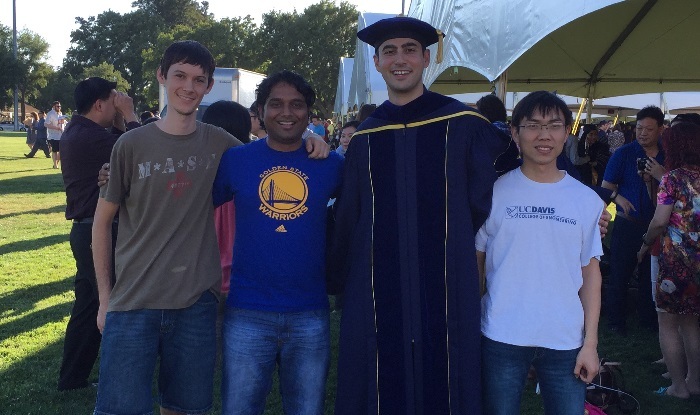 Tim, Satyabrata, Jon, and Shifu at Jon's graduation ceremony; June 15, 2017. 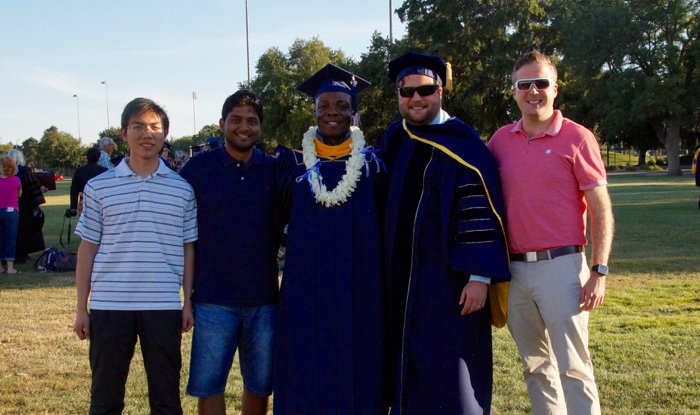 Shifu, Satyabrata, Emmanuel, Aaron, and Lucas at Aaron and Emmanuel's graduation ceremony; June 9, 2016. 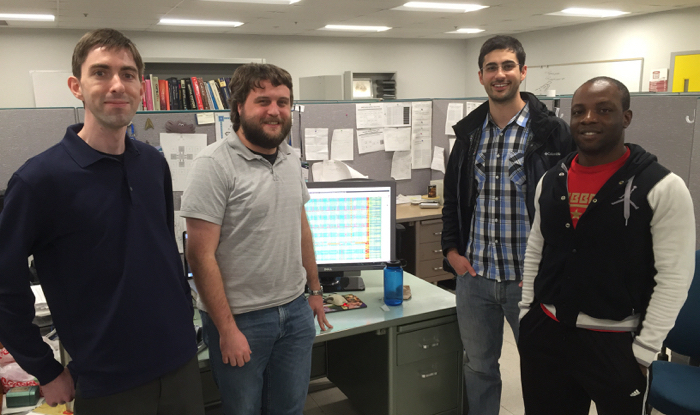 Brent, Aaron, Jon, and Emmanuel finishing up the KiloCore2 tapeout; March 1, 2015. 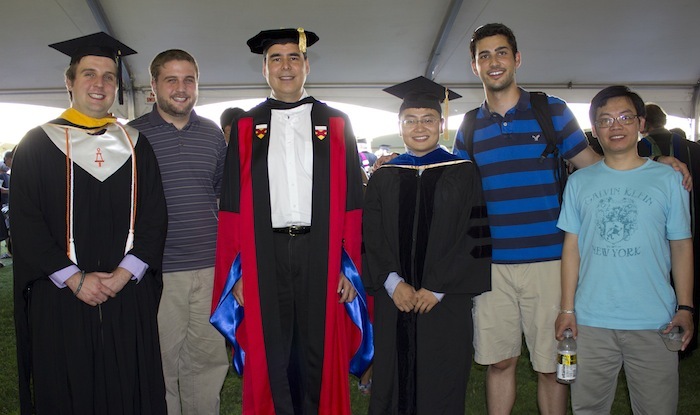 Lucas, Aaron, Bevan, Zhibin, Jon, and Anh at Zhibin and Lucas' graduation ceremony; June 14, 2012. Aaron, Michael, Emmanuel, Jon, Anh, Samir, Zhibin, Brent, and Bin in the office-lab; April 4, 2012. 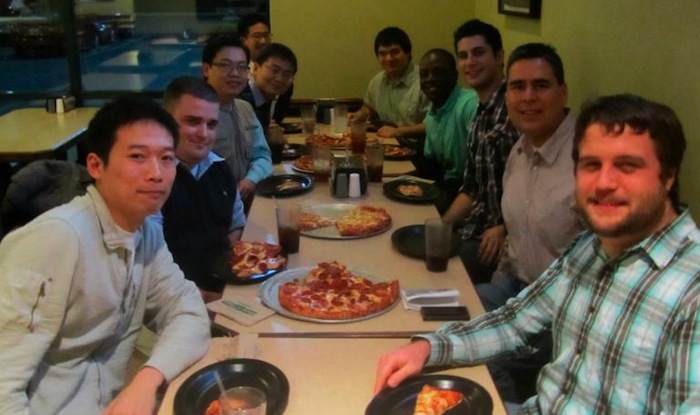 Group dinner celebrating Jeremy, Lucas, and Trevin's graduations as well as Anh's best paper award and Bin's best paper nomination; January 25, 2012. Group lunch celebrating end of Spring quarter; June 10, 2009. Dean and Anh in office-lab; January 25, 2009. 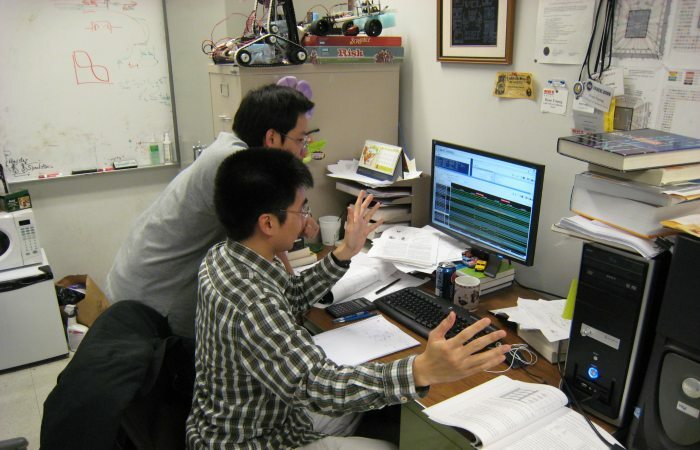 Dean, Zhibin and Paul in office-lab; March 27, 2008. Zhibin, Dean, Anh, Tinoosh, and Paul working on AsAP2 bringup; October 12, 2007. Tinoosh, Dean, and Zhibin working on AsAP2 bringup; October 11, 2007. 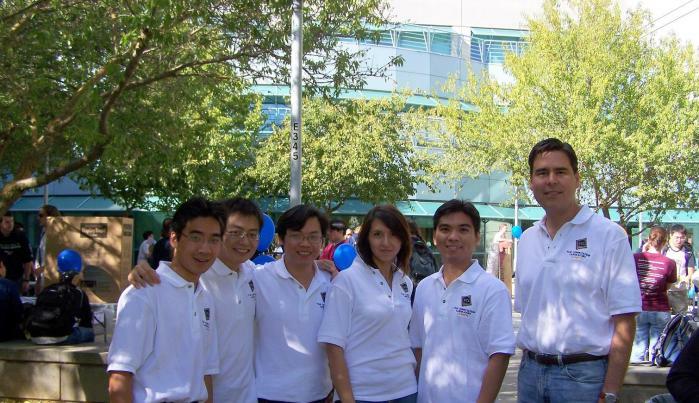 Dean, Zhibin, Anh, Tinoosh, Paul, and Bevan at ECE Grad Student BBQ in Kemper courtyard; October 4, 2007. 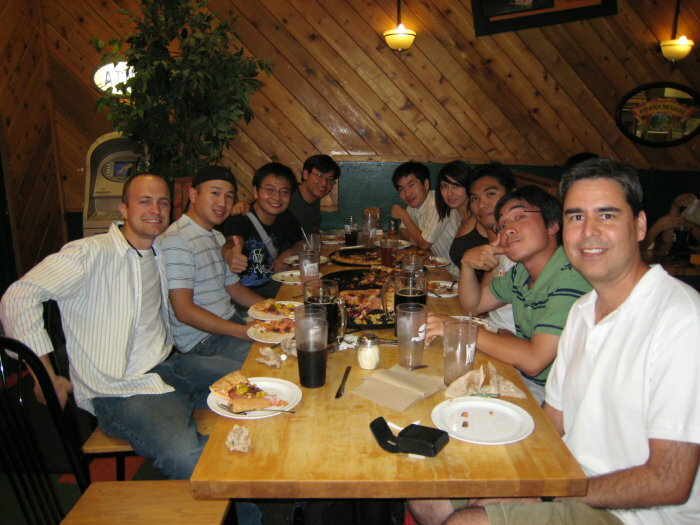 Toney, Wayne, Zhibin, Anh, Zhiyi, Tinoosh, Paul, Dean, and Bevan celebrating Toney's and Wayne's graduations at Woodstock's; August 29, 2007. Tinoosh, Dean, Christine, Wayne, and Zhiyi in Kemper 2211; November 8, 2006. 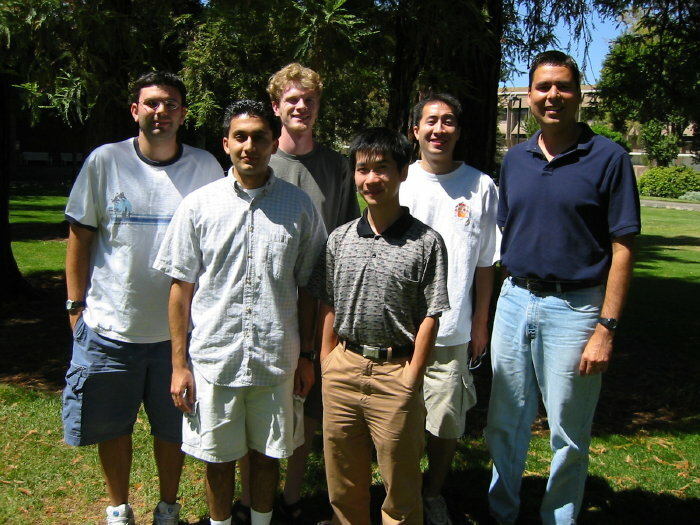 Ryan, Omar, Mike M., Zhiyi, Mike L., and Bevan near the quad after lunch; August 26, 2004.